The REDD+ SES Secretariat participated in the UNFCCC COP21 hold Paris, France, in December 2015 and presented outcomes resulting from the adoption of a transparent, participatory and comprehensive approach to REDD+ Safeguards the following side events. 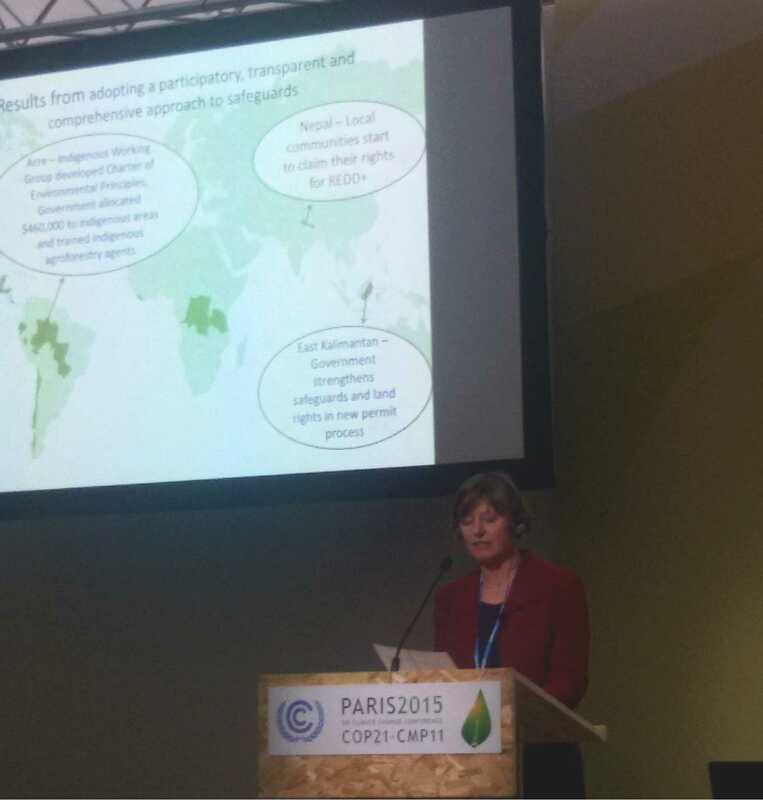 The REDD+ SES Initiative, Global Canopy Programme and University of Twente organised an official UNFCCC side event on Thursday 3rd December 2015. Joanna Durbin of the REDD+ SES Secretariat presented progress and results related to country adoption of participatory, transparent, and comprehensive monitoring and safeguard information systems for REDD+ and low-emissions land use. Magaly Medeiros from the Institute of Climate Change (IMC) of the State of Acre in Brazil, Wendy Pindeda from the Interethnic Association for the Development of the Peruvian Amazon (AIDESEP), Firmin Chimatani Tayori President of the Amarkaeri Community Reserve (ECA) from the Region of Madre de Dios in Peru, Elvis Tishabasu Muanza from WWF Democratic Republic of Congo and Dil Raj Khanal of the Federation of Community Forest User Groups (FECOFUN) in Nepal, among others, joined a panel to discuss experiences with stakeholder participation in providing information on safeguards and community monitoring, including using technologies such as smartphones and drones. The REDD+ SES Initiative partnered with CIFOR, the Governor’s Climate and Forests Task Force, the UN-REDD Programme, the Earth Innovation Institute, the University of Wageningen and the Rights and Resources Initiative to share experiences and lessons learned during the Global Landscape Forum on Sunday 6th December 2015. The REDD+ SES presented its new Briefing on outcomes in ten countries from the adoption of a transparent, participatory and comprehensive approach for REDD+ safeguards at the ‘Why safeguards matters’ booth. Aurélie Lhumeau of the REDD+ SES Secretariat co-organized with the UN-REDD Programme a story telling session at the pavilion during which Milagros Sandoval from Conservation International Peru and Novia Widyaningtyas from the Ministry of Environment and Forestry of Indonesia shared their experiences from participating in REDD+ SES Exchange & Learning events workshops. The REDD+ SES Initiative organized a discussion forum with USAID, Climate Focus, ZALF, CIFOR, IIED and IUCN. 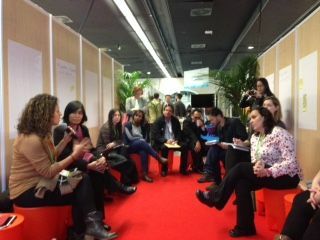 This session focused on land and resource rights and equity in the design and implementation of REDD+ activities. It explored why equity and resource tenure security are important for the effectiveness and sustainability of REDD+, as well as for increasing non-carbon benefits, and addressed practical measures to achieve these objectives. Andrea Quesada, consultant for the REDD+ SES Initiative and IIED, presented findings from action research on equity in REDD+ conducted in the Yucatan Peninsula in Mexico and in San Martin Region in Peru. Phil Franks of the REDD+ SES Secretariat and IIED joined the panel discussion and shared some thoughts on how equity is addressed in REDD+ safeguards. Joanna Durbin of the REDD+ SES Secretariat participated in the panel discussion for this session organized by the World Agrofrorestry Centre (ICRAF). It provided an open platform for discussing farmland restoration through various agroforestry practices using inclusive and multi-stakeholder approaches. Joanna Durbin shared some lessons learned from multi-stakeholder processes for REDD+ safeguards and how they can inform landscape restoration approaches. At a side event on Monday 7th December organized by the State of Acre in Brazil, Joanna Durbin of the REDD+ SES Secretariat presented Magaly Medeiros, Director President of the Institute of Climate Change of the State of Acre in Brazil with a certificate confirming that Acre is the first country to have completed the full ten-step process of the guidelines of the REDD+ SES Initiative.